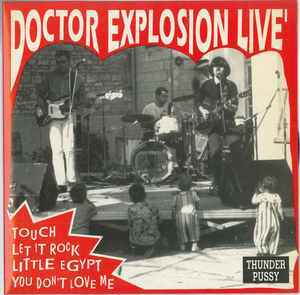 You Don't Love Me "No Me Quieres"
Let It Rock "Déjalo Sacudirse"
Fake live ep by Doctor Explosion and their second record, released on their own label Thunderpussy records and published by the label that released their first album soon after, Romilar-D Records. This record had a few pressings, each of the which with a different cover background color. This one (red) may be the second.